LG to launch PJ9 levitating speaker at CES 2017 | What Hi-Fi? LG is taking the idea of a wireless speaker a step further with the launch of a Bluetooth speaker that plays music while floating in mid-air. 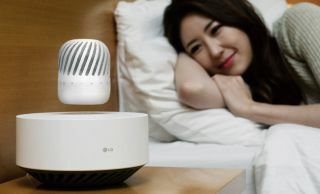 The LG PJ9 levitating speaker uses electromagnets housed within a base station - or Levitation Station, as LG refers to it - to make the speaker hover a few centimetres in the air. Sound comes courtesy of a 360-degree omnidirectional speaker inside the floating section of the PJ9 and a subwoofer inside the base. Connect a Bluetooth device, phone or tablet to the speaker (you can connect up to two devices at once) and you'll get 10 hours of music before the portable speaker runs out of battery. And the floating speaker has a special move: when the battery is running out of juice, the speaker will lower itself onto the Levitation Station in order to charge, all without interrupting your music. Thanks to its rechargeable battery and IPX7 compliance, LG’s levitating speaker is good for using outside, promising to withstand “adverse weather conditions”. The floating speaker isn’t an entirely new concept. Earlier this year we saw the Making Weather floating cloud speaker and back in 2014 there was the Crazybaby Mars levitating speaker. There’s no information on a release date or price for this LG floating speaker as yet, but we expect to hear more about it and get a closer look when it launches at CES 2017, which gets under way on Wednesday 3rd January. LG is expected to announce a whole new range of wireless audio products, alongside its 2017 TV range, at the Las Vegas electronics show.